The Tanganyika Masked Weaver Ploceus reichardi is a typical 'masked weaver', but one with a restricted range. 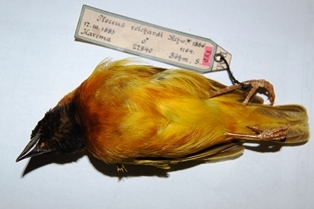 Two males were collected as type specimens from near Karema, Lake Tanganyika, in 1883: this species was named after the lake, not the country, so there is no need to rename it to Tanzania Masked Weaver. The male in breeding plumage is distinguished from Lesser Masked Weaver P. intermedius, Southern Masked Weaver P. velatus , and Katanga Masked WeaverP. katangae by the strong chestnut wash on breast and flanks. It is similar to the Lake Lufira Weaver P. ruweti but the black on top of the head is confined to the forehead, not extending to the hind-crown. The female and non-breeding male Tanganyika Masked Weavers are dull olive above, the breast is orange, the rest of the underparts are dull yellow, with a white belly, and flanks with a dusky brown wash. 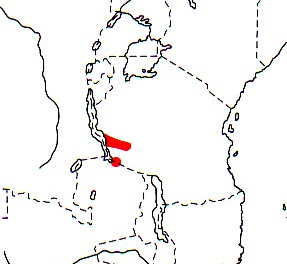 The Tanganyika Masked Weaver is locally common in Karema, Namanyere and Lake Rukwa in western Tanzania, and it is common along the Saisi River in north-east Zambia (see red on map right). It is monotypic. It has been thought to form a superspecies with other 'masked' weavers, but molecular data suggests that it is only closely related to the Katanga Masked Weaver. The Tanganyika Masked Weaver inhabits swamps with papyrus, bulrushes and Phragmites reeds, sometimes far from dry land, but may forage in woodland. It roosts in swamps. Its diet is mainly grass seeds, and probably takes termites. The Tanganyika Masked Weaver is probably polygynous. Males are territorial, in colonies of 4-30 nests and sometimes up to 150 nests. The nest is retort-shaped without an entrance tunnel. The nest is tightly woven by the male, using narrow strips of grass blades. A distinct ceiling of grass strips is built. The nest is lined with fine grass panicles and sometimes feathers. The nest is suspended from bushes over water, or attached to grass or reed stalks. The clutch is 2-3 eggs, and the eggs are either bluish with dark brown spots or greyish-olive with diffuse darker markings. Incubation and nestling periods are unknown. Some colonies in bushes were accidentally destroyed by feeding elephants. Nestlings have been collected for food by local people. The Tanganyika Masked Weaver has one PHOWN record (see PHOWN summary) but many more are needed to study the variation in colony size in this species. Submit any weaver nest records to PHOWN (PHOtos of Weaver Nests) via the Virtual Museum upload site.